Good Morning….The benefits of Sunshine! Adelaide Hills Pastured Eggs produce the most exquisite eggs you’ve ever tasted. Bold statement yes, but the facts is that chickens need sunshine to produce eggs rich in Vitamin A & D. Which is why our girls are up early every morning foraging on nutrient rich pastures in the glow of the rising sun. Which is why pastured eggs from chickens living permanently outdoors taste so damn good. Factory farmed chickens miss out on all this and so do the people who eat them. So if you want the best, come and taste whats on offer at Adelaide Hills Pastured Eggs, and a “top o the morning to you” from our girls! Congratulations to the Black Lemon in Nairne, they have received their first delivery of delicious pastured eggs today. So when your ordering eggs from them you’ll know the eggs are so nutrient dense you couldn’t pack any more into them if you tried. Like us they are committed to supporting local business and producing exquisite meals and tapas. At Adelaide Hills Pastured Eggs we are dedicated to producing eggs that pack a punch and with flavour that is out of this world. Simply its Nutrition by Nature. Tom just wants some time to himself and his bone! Mornings are a busy time here at Adelaide Hills Pastured Eggs. Tom has been hard at work all night guarding his girls and keeping them from harm, so you would think he’d get a few moments to himself to relax and chew on a well deserved bone. Not so. Tom realizes that his chickens are an inquisitive bunch, definitely not shy and have no understanding of ‘personal space’. We feel for you Tom, we truly do and we admire your patience and gentle approach with these girls. However we agree sharing your bone though is pushing it a bit too far. Its tough being a livestock guardian dog here at Adelaide Hills Pastured Eggs. People ask how do you know your eggs are so good? Simply because we test our pastures to ensure they are of the highest quality. Leaf analysis testing conducted at the Southern Cross University shows our grasses and legumes are sufficient or above in all minerals tested.By design these fantastic results are reflected in the taste of our eggs. We test regularly throughout the year and the crude protein levels are extremely high, revealing a nutrient dense eggs that packs a punch. We take the time to get these results so you can enjoy the best (wouldn’t it be nice if other food producers took the time to do the same?). 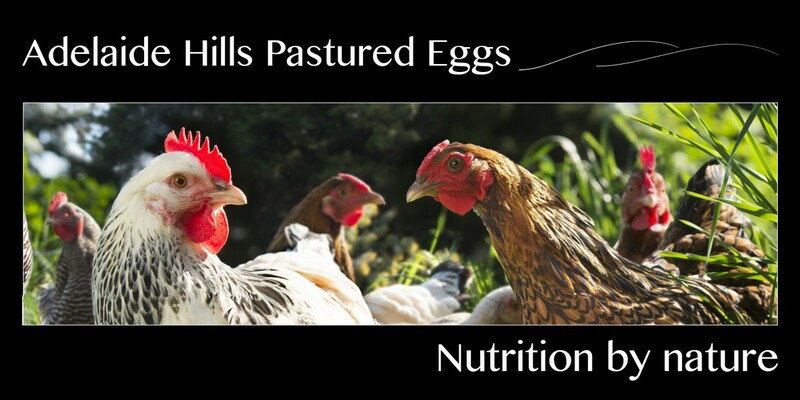 So If your looking for the best, see whats on offer at Adelaide Hills Pastured Eggs. Imagine breakfast eggs that are divine to taste and packed full of goodness. Knowing that your pastured eggs are super fresh should put a smile on your face….then you’ll take that first bite, and you’ll be hooked. These beauties are available from tomorrow morning at the Adelaide Hills Farmers Market. Tom the Maremma has been ‘pep talking’ his girls into laying more and more eggs every day. Nutritionally you could not pack any more goodness in even if you tried. These eggs from Adelaide Hills Pastured Eggs are fresh, polished, inspected, stamped and ready to eat! . With supermarket eggs they are usually weeks old, well here’s the good news, at Adelaide Hills Pastured Eggs fresh means we talk in hours. Enjoy. Nutrition by Nature. We will have our eggs on sale at the Adelaide Hills Farmers Market this Saturday from 8:30am. Tom has been making sure his girls a) stop eating his breakfast and b) get busy laying eggs so you can enjoy your breakfast with some yummy Adelaide Hills Pastured Eggs. So we would love to see you there on Saturday at Mann St Mount Barker. Our Chickens are in Heaven…Its Moving day! We move our chickens to fresh ground every other day, and they could not be happier. There is a real buzz in the flock as they search and explore their new home. Of course we feed our girls a nutritious commercial layer feed, which is packed full of yummy grains and seeds, but on moving day, the chickens cant wait to scratch new ground in search of bugs and worms and to pick on fresh new grasses and legumes. This is Chicken Heaven! These animals are truly amazing. They bond with your livestock and work day & night to protect them from harm. Tom recently featured in the Mount Barker Courier newspaper as a working dog in the Adelaide Hills. Livestock guardian dogs are being noticed because of movies like “ODDBALL” but we truly admire their hard work and 24/7 attitude to protecting their “flock”. Now Tom doesn’t get a day off, he lives with our chickens and protects them from all manner of predators such as foxes and hawks. So we don’t know what he’d do on a “day-off,” but we feel this photo comes close to visualizing what he’d be doing if he got an RDO. Thanks Tom, your a Marvel! When was the last time you bought eggs from a supermarket and got a double yoker? Its like childhood memories. Well our girls are just starting to lay at 20 weeks and look what is hitting the pan! This is incredible and we believe its all in the nutrition that the chickens are receiving. The crude protein levels in our grasses and legumes were off the charts and its reflected in the final product! Well done girls!